For the first time, Stampin’ Up! 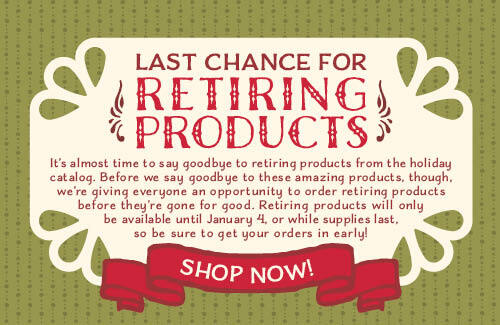 is announcing the products from the Holiday catalog that are retiring and will not be available next year. This helps us plan as Demos and helps you to know what is going away so you need to purchase now! As always, supplies are limited so if there is something that you really want – don’t wait too long to order it! Also – check below for the Weekly Specials too! Ready to order? You can visit my online store HERE. If you order is under $150, use the Hostess code 2CATZWT3 and I will send you a ribbon sampler. I love to share hostess benefits with my customers! Stampin' UP! Weekly specials. Bookmark.